I wrote last week about why I like thrifting garments off-season: it gives me several months’ breathing room to mull over my wardrobe, figure out what worked/didn’t and where the holes are, and assemble what I want in the lineup for next season. Thrift shops make this relaxed, thoughtful process possible because they have all seasons of clothing available all year ’round instead of for just 2 weeks before everything good is sold out (thanks retail stores). This may seem counter-intuitive, but the juxtaposition actually helped me get a handle on what in my winter closet needs fixing. See, my spring/summer wardrobe is in nickel condition. I love the silhouettes I’ve found for warmer weather (sheath dresses; popover tunics, relaxed blouses, or boxy tops over straight/tapered pants) and just seeing the clothes in my closet, let alone putting them on, makes me smile. My winter wardrobe? Not so much. I love the dresses and coat I found last fall. And I finally ditched winter skirts. But the pants + top + topper combination is just…off. I’m over my wide-legged pants (yes, just as they are coming back into popularity. I can’t seem to sync with trends for the life of me. Whatever. That just makes me cool, right?). They don’t keep my legs warm once the weather gets chilly….all that air circulating inside that baggy lower-third is no good. I’m struggling to find a thick, sweater-like cardigan to layer over my thinner tops. I had a great Banana Republic off-white version that died a few years ago, and since then I’ve struck out on something warm enough, neutral in color, and with a knit that doesn’t distract from the rest of my ensemble. No to this one (right length and neck, but too variegated, toggles distracting, and didn’t go with grey) and no to the yeti (too short). The shirts I typically want to wear underneath this thick cardigan topper are too patterned so they clash with the knit on the cardigan. Plus they’re not all that warm; they go better with a light cardigan for fall/spring. My thought is, if it works, it works. I’m looking for slimmer/tapered warm winter pants, in cream and grey and maybe navy. See What I’m Currently Thrifting for inspiration pics re: color. (On the fence about keeping these; definitely warm enough but—hard to see in photo—they’re more taupe than grey so they don’t go with my grey tops/sweaters.) Slimmer pants will also let me get more wear out of these awesome ankle boots. I’m replacing my too short (thus only wearable under dresses) cream turtleneck with one that can be worn over pants. Speaking of, I’m thinking of sticking to just turtlenecks as my base layer. I might get sick of them but I know they’ll go with everything, no worries about clashing with the knitted patterns in my cardigan. Speaking of that, I’m looking for a cream or navy cardigan to go over those basic turtles. Then I’ll set it off with some bold winter jewelry that can really shine against the solid turtleneck background. And I’m going to wait ’til I find my pants before I try to find anymore sweaters, because those pants will determine how the silhouette looks. For example, I’ve stayed away from oversized sweaters because I don’t like how they look with wide-legged trousers; but they would look great over slim/tapered pants. 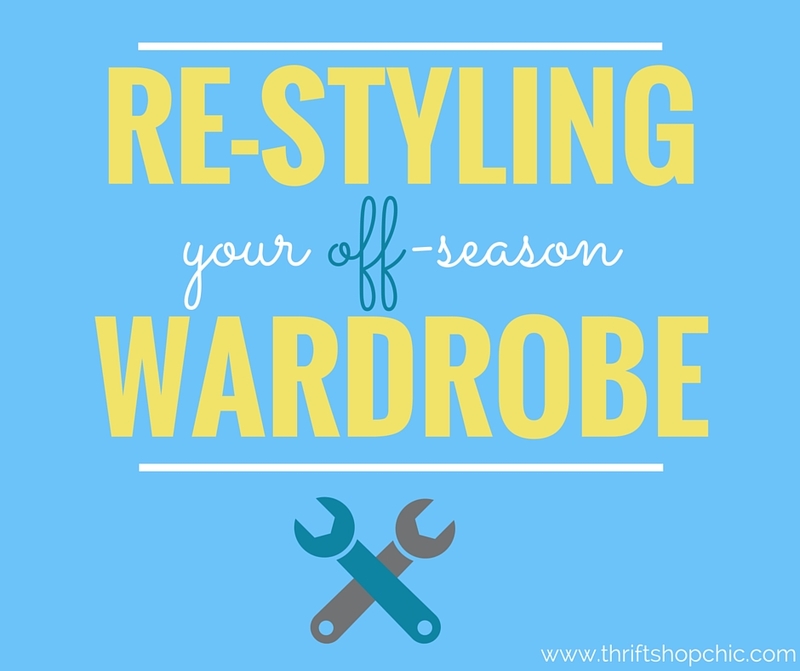 Do you thrift things off-season as well, or can you just not stand the thought of woolly sweaters and tweed pants in warm weather and vice versa? Any suggestions for how to address the above problems? Or maybe a diagnosis I’m missing? I’m alll about thrifting out of season, so I get ya. And like you, I prefer longer sweaters with skinnier pants, or shorter sweaters with straight-leg pants. I feel sort of “too exposed” in skinny pants and a short sweater, and “too sloppy” in wide-leg pants and a long sweater. Your I-have-nothing-to-wear-with-it favorite sweater would be great with a simple pair of dark-wash jeans, of course! Sarah, I totally agree with your too exposed/too sloppy extremes. Cardigan Appreciation Society, sign me up! You’re totally right about level of formality. Here’s my conundrum: I have a couple of flat-knits I love, but even though one is wool, they just do *not* cut it for warmth during the coldest months. Those days when you want to just pile on the cable/Aran knit type sweaters but you still have to go to work and still want to look polished..any suggestions? It’s partly why I’m looking for more sweaters, but sweaters aren’t as versatile as a cardigan paired with several tops. Dead on, I totally rock that favorite sweater with jeans + ankle boots… but at work only on Fridays. And it’s just so smart I’d love to wear it to work more. Thanks for weighing in! Love your insights. Ah, work dress codes — I have to admit that’s a bit of a blind spot for me, since I work from home. For your favorite sweater, what about an above-the-knee pencil or straight skirt in a knit fabric? I have something like that in merino wool but I bet ponte knit might be knocking around the thrifts too. That would look great with ankle boots and I think the knit fabric keeps things a little more modern, as well as being comfortable! I actually wear my knit skirt with bare legs in summer as well, I’m amazed how versatile it’s proven to be. For super-cold days, 4 suggestions: (1) silk long john top as your base layer; (2) merino or cashmere fine-gauge sweater underneath your cardi (these materials are just plain warmer than cotton jersey imo); (3) cashmere cardigan (can be tough to find at the thrifts, admittedly — I buy mine on Ebay but I find cashmere an incredibly practical material — to me it’s warmer than anything else in winter, yet also lightweight and wearable on cool summer mornings); (4) silk scarf around your neck for extra warmth. I’ve been known to employ 3 of these suggestions simultaneously so I feel ya on the need to stay cozy on the coldest days! Great suggestions! I have nixed winter skirts for now because I don’t like all the extra separate layers that go with the leggings, base, topper et,.- I feel like a kid in a snowsuit! But I have had my eye out for a knit stretchy skirt for work and casual that could go over bare legs…hard to find but I agree, so versatile! I live in the south so I haven’t yet sprung for silk longjohns – they are first on my list if I ever move back up north. In fact I just donated my traditional waffle knit longjohns ’cause I never wear them and they’re so darn bulky. I’ve had decent luck finding cashmere cardigans and sweaters here so I’ll keep that in mind for my flat knit topper!